Biological dental articles and information from Houston biological dentist Dr. Marilyn K. Jones. 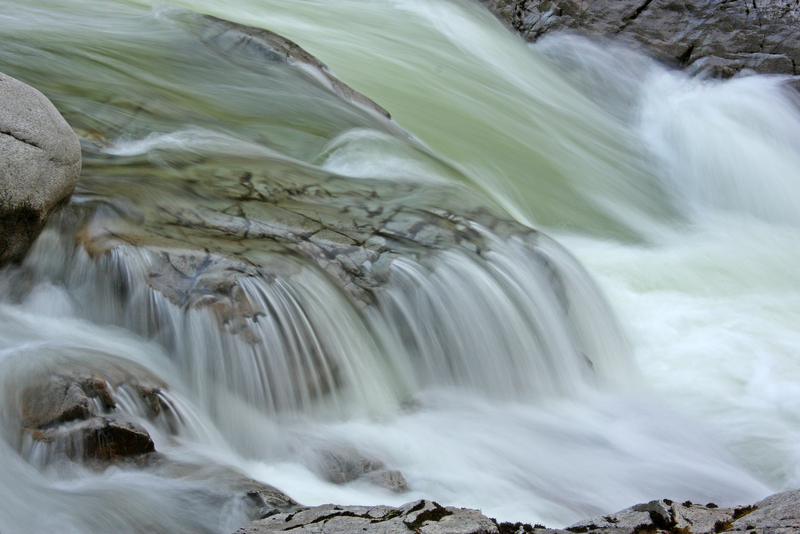 There’s a lot of noise pollution out there regarding the argument for or against fluoride. Fluoride has been a staple of America’s dental regime since the nineteen fifties. Without thought, or apprehension, communities have taken what the dental specialist pushed as gospel, therefore fluoride is good for you. It’s an equation more than six decades in the making. If a little bit of fluoride is good for teeth, than a lot must be even better. Until its not. Interestingly enough, fluoride is the one supplement that serves no function. The human body does not need fluoride to function properly. Fluoride added to water is a fact of life for many communities with otherwise pure and clean, naturally occurring water supplies. Except that the fluoride added to municipal water supplies all around the country (and the world) is not naturally occurring calcium fluoride. More than two thirds of Americans are currently receiving artificially fluoridated water at their tap. Water that is fluoridated by what essentially is a chemical waste product. A waste product that is toxic. The entire argument for the use of fluoride is based on studies in communities with naturally occurring mineral deposits of calcium fluoride. Recent studies from communities with artificially fluoridated water have not been able to backup or substantiate the original findings of reduced dental decay and cavity incident. So why do NEW communities (around the world and) here in the U.S. continue to begin new fluoridation programs on their municipal water supplies? Conditioning and propaganda. Decades of trusted professionals telling us its good for us. Federal and government backing and American Dental Association support. All part of the propaganda to not change the status quo. Many Americans are aware that fluoride is a toxin. Yet somehow we look past the fact that a tube of toothpaste easily contains enough fluoride to kill a small child. 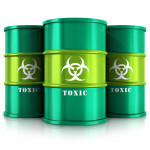 As consumers we’ve educated ourselves about all kinds of toxins that find their way into our bodies, even switching out the containers in our homes to eradicate exposure to BPA’s and other known chemicals with potential to harm. Fluoride saturation is not an unknown. Science has linked fluoride exposure to cancer, complications with diabetes, dementia, arthritis, mental defects, alzheimer’s, birth defects and a whole myriad of other complications. Still we have not eliminated or reduced our exposure, our childrens exposure or the eventual overload to the environment to the toxins of fluoride. Fluoride saturation in water, food, and personal care products: drowning us in toxic chemicals. Since fluoride is nearly impossible to filter out of water the best option to reduce exposure is to get it out of toothpaste and mouthwash products in your home. There are alternatives that are very effective, maybe more so than fluoride, at remineralizing enamel and strengthening teeth. In essence fluoride only effectively works topically, unless teeth are still forming below the gum line, otherwise ingesting fluoride serves no purpose and, in fact, is toxic. In the long list of everyday things people come into contact with that are toxic, potentially even deadly fluoride should not be overlooked or segregated from the worst offenders. Fluoride hurts people and in many cases is forced on us through regimented doses in public water systems. Contact our office for products and information about alternatives to fluoride. Anyone with kids of any age knows that strategies to encourage proper brushing are vital. Starting at an early age parents work to evoke life long hygiene habits for their kids. Teeth brushing is no exception. Children are not alone in the practice to be good tooth brushers. Even as the “responsible adult” we need a “carrot” to prevail in our endeavors at the end of a long day. Remembering that time spent developing good habits will reap rewards for both you and the child. Songs, games, charts, rewards, fun timers, even apps for tablets and phones come into play when teaching good habits. Many good examples exist on the internet. A quick search will bring a plethora of choices to your finger tips. Switching these and fine tuning them as needed to get the desired result may be a solution to waining interest. 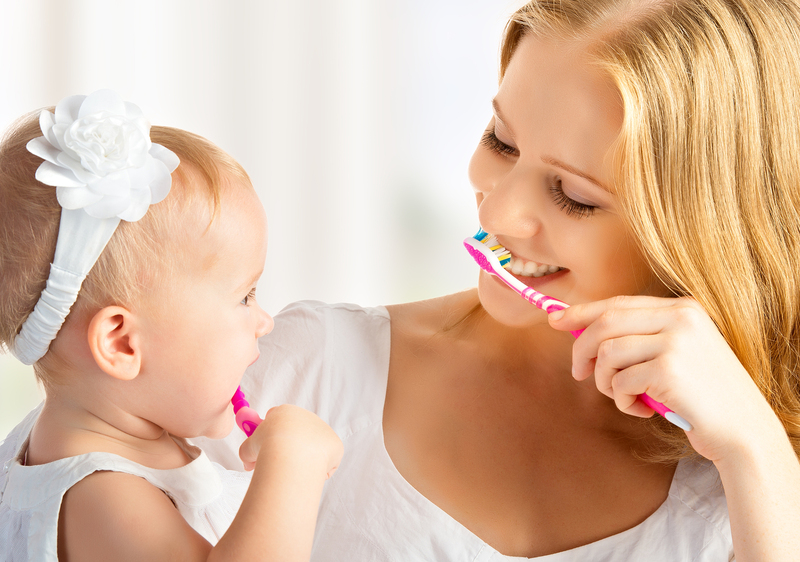 Teaching kids, when they are young to develop good brushing habits is time well invested. Removing the biofilm–daily–on teeth and oral surfaces. Doing so leads to a lifetime of benefits, dental health being at the top of that list. 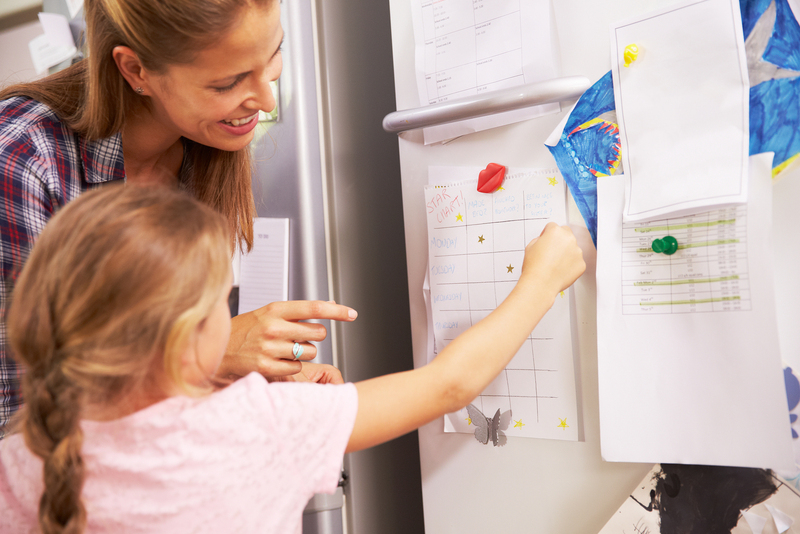 Forming positive habits can be a very natural, easy process with young children. Starting from the time they are infants, small children want to emulate their parents and those around them, therefore make brushing a family social event. Mom’s and dad’s who brush with their little ones around are sending a positive message that brushing is fun and easy. Studies show people form an opinion about who you are in a matter of minutes. One of the key factors in that judgment happens to be your smile. What a valuable gift to help teach your children a lifelong, healthy habit that will continue to benefit them in a multitude of ways. Daily brushing ultimately reduces the risk of tooth decay, gum disease, and improves long term overall health . It will, in turn ultimately reduce long-range cost associated with dental care. Plus healthy, clean teeth just look really great! 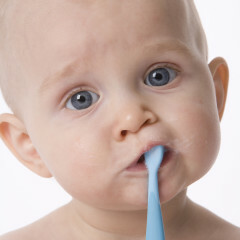 For infants and children under two or three, simply let them mirror your behavior while brushing by providing an infant type of soft and safe toothbrush—there are numerous options–no toothpaste is required but if you do use one make sure to use one with no fluoride that is safe for infants and children. Children between three and four who are still working on good brushing habits still benefit from seeing you carry out your daily brushing but they are also easily influenced with a little incentivizing. Consider an extra story at night when they brush on their own. Even simple sticker charts for a week to five days in a row with a small prize at the end. Some ideas that might work in your family could be a sticker collection to add to, matchbox cars, hair ties or clips, special socks with favorite cartoon character, coloring pages or books, small puzzles, even a picking out a balloon when age appropriate and supervision are possible, maybe three minutes of screen time per brush works for your family. Find what works and fits into your family’s routine and natural routines. Children bigger and older start having more dexterity and can do most of their brushing unassisted while younger kids may need you to follow behind them. Older kids can also be taught to run their tongue on the surface of teeth to check for spots they missed. Clean teeth should feel slick and smooth with no rough areas. By kindergarten children can be well on their way to initiating brushing all on their own. Keeping a brushing chart can help with stickers or a pen to add stars or checks when kids complete their morning and nighttime brushing. Though incentives can be helpful, by this age kids are also able to grasp concepts about their health and getting rid of germs that make cavities. Incentives, if needed, may only need implementing for good check-ups. These are just ideas intended to help increase brushing compliance in the entire household. Perhaps you will find that it’s helpful to change things up and stay creative. Perhaps you’ve found something useful here or you’re inspired or re-inspired with another tactic to help get brushing to be your kids new favorite habit. It’s worth the effort and the dividend will payout over an entire lifetime. Twice yearly check-ups go hand in hand with perfect brushing habits and will help keep everyone in the family on track and ready to address problem areas often before decay encroaches. Give us a call today for questions or appointments. Tooth Care During Pregnancy. Conditions during pregnancy make mouths more vulnerable to disease. A little extra attention goes a long way to maintain a healthy smile. Step-by-step and trimester-by-trimester here are the things that will keep teeth healthy. It’s still early in the pregnancy but hormones and morning sickness can start making big changes to oral wellness. Check with your insurance provider, you may be allowed extra cleanings and check-ups while pregnant. If you’re suffering from morning sickness stay hydrated. Also, Rinsing the mouth frequently keeps gums healthy. Avoid triggering nausea, use a bland toothpaste and small, soft toothbrush. Contact your dentist, ask if they have any special recommendations during your pregnancy. Check gums regularly for Pregnancy Gingivitis. Look for puffy, inflamed gums. Changes in hormones often cause symptoms in the mouth too. Trimester two marks the middle of pregnancy. The end is closer, stay on top of oral care to keep teeth healthy. In the second trimester avoid eating sugary snacks, your gums are the most vulnerable at this point in the pregnancy. DO NOT skip brushing or flossing. Vigilance will pay off with healthy gums and teeth at the end of pregnancy. Take vitamins and supplements as instructed by your doctor. Make sure your diet includes lots of Vitamin C, Calcium and Vitamin B12. By the second trimester some patients develop small, temporary tumors on the gums, called Pregnancy Granuloma. They can be found in the mouth, on gums or even on lips. The home stretch is the last 6 to 12 weeks of pregnancy. Take special care to not let all of your hard work be wasted. You may be tired, fatigue can be chronic in pregnancy. DO NOT skip brushing or flossing. Vigilance will pay off with healthy gums and teeth at the end of pregnancy. At this stage, hold off on any dental procedures you need. Consult your doctor but in most cases this is the best option for mother and baby. Schedule a cleaning appointment for after the baby is born. Many mothers choose to nurse their newborns. Nursing has a few provisions to keep teeth tip-top too. Eat lots of mineral dense foods like nuts, cheese, dark green leafy foods as they help make up. for calcium and other nutrients needed for breast milk. Ensure that your body has enough to go around. Use vitamins to supplement as recommended by your doctor. Teeth need strong dentine to keep from becoming brittle and hypersensitive. Proceed with any dental work, X-rays, local anesthesia and nitrous oxide are all considered safe while breastfeeding. Consult your dentist about removing silver fillings or any other dental work that may potentially contaminate your breastmilk. Mother Hood is wonderful, its also a lot of work. Make life easier for yourself by maintaining healthy teeth. With ceramic implants there will never be grey or silver showing through. Ceramic never no discolors or tattoos surrounding soft tissue. Nothing beats ceramic implants for tooth replacement. Hands-down, when it comes to looking just like your own, natural, teeth nothing compares like an all ceramic implant. As a patient, it’s up to you when it comes to replacing a tooth. From prostheses and bridges to permanent dental implants, options abound. For most patients and doctors, implants top the list. In addition to their functional benefits, implants are also practical, durable, and much more pleasing aesthetically. At our office with Dr Marilyn K Jones DDS, we prefer ceramic implants. Using ceramic is outpacing other options for tooth replacement at an exponential rate. The material in theses permanent dental implant [zirconia], a ceramic that is extruded from Zirconium, is biologically inert in the human body. Zirconia also has a high tensile strength (meaning it is very strong). What really makes the difference for many patients is the aesthetics. Ceramic/zirconia implants are considered the most realistic looking tooth replacement option available on the market. Face it, we all want our teeth to look good. Healthy gums with no silver tattoos look healthiest. Ceramic permanent dental implants so closely match the look and feel of natural teeth, they immediately lend a sense of confidence to the patient. There is no denture to mess with, no embarrassing creams or gels. 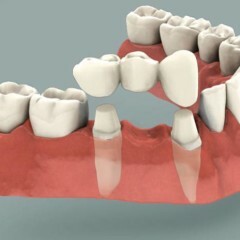 No speech issues associated with tooth loss and tooth replacement, often associated with dentures or other prostheses. There are no restrictions on diet and eating habits. No risk of losing the implant or damaging it while eating. Having a ceramic dental implant also reduces the chance of bone loss in the jaw. Bone loss results lead to a number of additional dental issues and a diminished jaw-line. Metal posted implants–made from titanium, stainless steel or other alloys–for permanent implants can still be performed. In addition to potential health concerns, metal posted implants have aesthetic drawbacks. The metal material traditionally used in implants (for decades), is still available but leaves a silver-grey color along the gum line. The discoloration makes it obvious that your tooth has been replaced. White implants made from zirconia don’t have that issue. Not only are they the same color as your teeth, they actually promote soft tissue growth This means any chance of receding gums are reduced, as well. With metal implants, the gums can’t grow properly, leading to a distinguishable line at base of the new tooth. Even if you experience slight gum loss with ceramic implants, there’ll never be a dark metallic line at the gum line. Implants are permanent: make sure you find a skilled, experienced doctor to place one. It could be a toothache, maybe you’re due for a cleaning and want a new approach. People call biological dentists looking for a healthier alternative to traditional practices. New patients are looking for the safest and healthiest way to get out of oral pain, and keep a healthy mouth. At our biological dental practice in Houston, Texas, we get it. 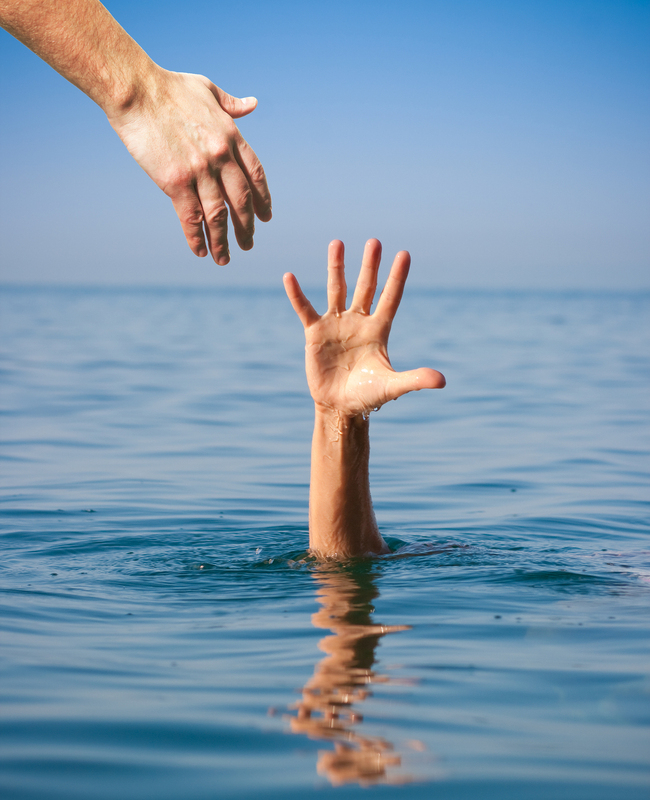 Unfortunately, the safest way to get out of pain is to not get into pain in the first place. Obviously things happen in life and sometimes a toothache is unavoidable. Frequently patients wait too long and a preventable dental problem escalates into a major dental emergency and often a major dental procedure. So how do you know when you should see a dentist? What are the early warnings signs so you nip things in the bud before they escalate to major problems? Floss regularly. I know you’ve heard it before, but I’m not telling you to floss to keep your teeth clean (you already KNOW that). If you floss regularly you will notice small cavities or other problems between the teeth sooner. 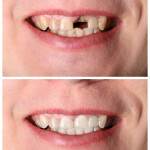 A small cavity is MUCH easier to fix than a big one – which might require an extraction and dental implant. If you floss and feel a small pain, twinge, or anything else weird or out of the ordinary, give us a call and we can probably prevent the problem from getting any worse. Look in the mirror. Most people are so used to brushing their teeth that they don’t watch themselves do it anymore. But spending a few minutes before or after you brush to look in the mirror can prevent a lot of problems. Pull your lips back and check along the gum line. Are there any bumps? Any discoloration? Lesions? All of those things could mean major problems forming under the gumline. And most of those early warning signs can prevent major dental work – and a major toothache – later. Pay attention when you eat. Pain or twinges in your mouth while eating are often a sign of bigger problems. If you eat sugar and have some pain, you might be getting a cavity (did you know many cavities, when treated early, don’t even need to be drilled out? Catch them early to save yourselves the whir of the drill!). Pain when eating hot or colds things? Your gums could be having an issue or maybe a cavity. Hurts when you chew on one side? Maybe an abscess, infection, cavity, cracked tooth… any number of things. Do your teeth hurt when you wake up in the morning? This is a classic sign of bruxism – or grinding your teeth. Why does it matter? If you grind at night, you are at risk for TMJ problems, cavities, cracked teeth, and more. All of which can be avoided with a simple bit guard if caught early. If your mouth hurts when you wake up, call and schedule an appointment. 90% of dental emergencies can be avoided by taking the simple precautions above. Regular visits to the dentist don’t have to be scary or painful – they can prevent scary and painful visits later, in fact. So give us a call. Check for the early warning signs, and prevent future dental emergencies. And if you do have an emergency, come visit our holistic dental practice in Houston – we are happy to help keep your mouth beautiful and healthy – and out of pain! A long history of enduring sensitive teeth doesn’t mean a lifetime. Minimize sensitive teeth related to food. Reduce sensitive teeth by chewing gum (sugarless of course). Chewing a stick of gum’s a great way to keep saliva flowing. Chewing creates ample saliva helping prevent periodontal disease (gum disease). The benefits of chewing gum are particularly measurable in the initial thirty minutes immediately after a meal. When you chew gum it increases salivary flow, helping to wash away debris and bacteria that may be stuck to teeth. Gum that contains xylitol can also aid in remineralizing enamel. We all know the dangers associated with sugar filled snacks and juices. Sugar wreaks havoc on teeth. Surprisingly, crackers, chips, cereal and other starchy snack foods can be just as detrimental as sugary snacks. Starches readily convert to usable sugars when consumed by the bacterial colonies in your mouth. Brushing after starchy snacks, even chewing gum can reduce the particles left behind. This keeps acids excreted by bacteria to a minimum, preventing periodontal disease and decay. It’s not enough to just brush and floss in order to protect your teeth from the threat of decay and periodontal disease. Eliminating sensitive teeth takes an all over approach. For optimal conditions you need to have your teeth cleaned. In the chair–the dentist chair–where your dentist and their hygienist can inspect each tooth and surrounding gum tissue for potential problems. While in the chair your teeth will be scaled (scraping off all tartar, stains, and plaque) with special tools designed especially for each tooth. Your tooth will even get scaled below the gum line. Plaque and tartar may be accumulating out of sight, initiating periodontal disease. After your teeth have been scaled they will then be polished. Polishing the teeth at the end of the cleaning is the step that gives you that slippery feeling on your teeth. Did you know when your teeth get polished it removes all microscopic abrasions and scratches? Places where bacteria might be able to get a foothold. That leaves teeth smooth and strong. Second only to smoking, studies show sleep is the next biggest factor in worsening periodontal disease. Our schedules are busier now than ever before. Often there are more demands for our time than we can accommodate. Lack of sleep has been shown to affect how rapidly we age. lack of sleep affects how readily our immune system respond. Sleep even effects our response times while driving or reacting to physical demands. Now scientific studies also conclude that periodontal disease gets measurably worse in patients who routinely get six or less hours of sleep per night. In the same studies, those patients who increased their nightly sleep up to seven or more hours saw a dramatic decrease in the spread of periodontal disease. Poor gum health, from gum disease, can stimulate nerves in teeth inducing sensitive teeth. Naturally, the first line of defense against all forms of gum disease is proper dental hygiene, including brushing twice daily, flossing once a day plus routine professional cleanings. Good oral health also requires proper nutrition. 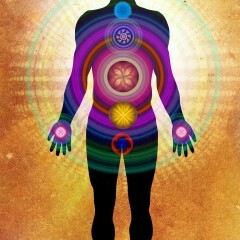 Supplements and nutrients that are known to work to boost the immune system. 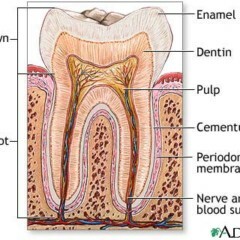 They also build collagen in the periodontal ligaments, and decrease inflammation. This helps to stop gum disease before it gets started – and helps to heal gum disease. One of the most researched and highly recommended supplements for fighting gum disease is CoQ-10. In Recent studies CoQ-10 was given in a blind study in which candidates with significant gum disease (periodontal disease) were chosen after aggressive brushing and flossing had no measurable impact. Those patients receiving the CoQ-10 had measurable and sustained improvement from their periodontal disease, in many of the patient’s gum disease completely resolved after only 8 weeks of therapy. There are a number of choices when choosing the CoQ-10 that is right for you. Learn about your options and choose wisely. The end of summer signals a number of challenges for families trying to keep teeth and gums healthy. Kids and young adults return to school, and adjust to busy, changing schedules. Parents work to reestablish systems that ensure all the homework, sports, attendance and class stuff, not to mention hygiene, get accomplished. August 6th is Friendship Day, nothing says “friend” like having a warm and healthy happy smile. Simultaneously August 6th is also National Fresh Breath Day. Nothing says celebrate your strong teeth (by brushing after celebrating) National S’mores Day on August 10th. Nothing says fall is coming like the end of August. August 25th decries brushing and oral health like National Kiss and Make Up Day. Smiling is the universal signal of good intentions and a trustworthy intention. Smiling makes you feel better, releases endorphins, and helps you live a longer life by focusing of being happy. People smile because it is a normal reaction to positive feelings, and expression of joy, and because the more you smile the more endorphins your body makes. Add 7 years to your life. Smiling has such a good impact on your overall mental and physical well being that it literally adds years to your life. No Pain, for more gain. Smiling reduces the effects of pain and aggression, raising pain threshold so that you can do more burpees. Skies the limit, studies find that on average smilers are more content and at the same time, more successful. Immune Booster, Smiling boosts HGH production and, among other things, reduces chance of cancer. The average adult smiles 20 times in a day, happy people smile 45 times a day, but children smile as often as 400 times a day. Get smiling and remember to brush and floss everyday to keep that smile tip-top. The First Year is the ideal time for the initial check-up visit with your child’s dentist. By twelve months old your child can have as few as one or two teeth or as many as twelve teeth. regardless of the number of teeth, making the dentist a familiar, friendly place ensures a better visit for you and baby. Between two and three years of age kids get their full set of baby teeth complete with molars. Molars appear last and the front middle teeth usually emerging first. Often the exact moment a child’s first dental visit is recommended can seem arbitrary. Some recommendations call for a dental visit at age one. Some recommend as soon as teeth first appear. With such a wide range it may be hard to decide how urgent that first dental check up should be. A good rule of thumb is to start regular check-ups with the dentist early. Start visits after the first tooth has erupted, or by the age of one. Very young children become accustomed to visiting various places and can quickly build a positive impression of the dentist office when they have several quick, easy and positive visits. Learning to sit in the dental chair, open up and say, “ah” and having fingers and tools in their mouth can seem strange for a little one. A small child with a few positive past experiences will be much more inclined to trust the dentist if and when a bigger issue should arise. A first visit to the dentist can be a very brief visit or last up to thirty minutes. The dentist will check bite alignment, teeth, and soft tissues. Since decay can start as soon as teeth erupt, the dentist will also thoroughly check teeth for signs of decay, and go over at home care with you and your child, and if indicated they may perform a gentle cleaning to remove plaque, tartar, any stains and quickly polish teeth. If you have any questions or concerns there will be time to discuss these things as well. Questions you have may range from fluoride use, number of times and length of time to brush, appropriate tooth brushes, or discussing previous bumps and tumbles that may leave teeth chipped or injured, mentioning those events can help your dentist evaluate potential future issues. Earlier in the day many children will have a much higher tolerance for new experiences and new people. A goodnights rest, and a healthy breakfast, will set the stage for successful dental visit and exam. Bringing a favorite toy, book, or blanket can also be helpful in building confidence while visiting a new place like the dentist office. First time dental check-ups are ice-breakers. They set young children up for positive experiences when visiting the dentist in the future. Being extra patient and calm go a long way in sending the message that there is nothing to be worried about or afraid of. Talk to your little one in the days leading up to your appointment. Telling small children how dentists help keep our teeth healthy and strong also relays a comforting, reassuring message. If your child is already older than one and has not yet been to a dentist or more than six months have passed, this is a good review, now is the perfect time to get that appointment booked. Metal dental implants were originally made out of commercially pure titanium or titanium alloy, providing the only option for implant tooth restoration for many years. After years of study, we now know that placing metallic dental implants and other restorative devices can potentially provoke allergic reactions. One study involving 1,500 patients demonstrated that although rare, titanium allergy could be clearly detected in dental implant patients. One research paper published in 2010 indicated that “…the risk of an allergy to titanium is increased in patients who are allergic to other metals. In these patients, an evaluation of allergy is recommended, in order to exclude any problem with titanium medical devices.” Further research on the subject noted a higher risk of positive allergic reaction was found in patients whose implants failed for no other known reason other than that they had a higher incidence of allergic reaction. Metal allergies are suspected by researchers and holistic dentists alike of being one of the most likely culprits behind the growing number of cases of autoimmune diseases in the United States including Chronic Fatigue Syndrome, Psoriasis, and Scleroderma, Lupus, Rheumatoid arthritis, type I diabetes, Multiple Sclerosis, Hashimoto’s thyroiditis, Guillain-Barre syndrome, and many others. A correlation between metal allergies and a weakened immune system suggests that it is not only important but imperative to take the necessary precautions to ensure that patients are biocompatible before allowing any substance or material to be permanently affixed into the mouth. Titanium allergy is rarely documented in mainstream medicine however, it has been reported that about four percent of all patients tested will be allergic to titanium. For those affected with a titanium allergy, the symptoms can be quite intense and somewhat confusing ranging from simple skin rashes to deep muscle pain and overall fatigue – common systems for an immune system that perceives itself under attack. 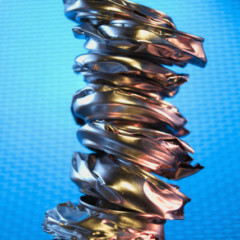 Like all metals used in the medical field today titanium releases tiny particles as it begins to corrode. In the case of an implant, these metal particles become ions and bind to proteins found naturally throughout the body. In some people the body reacts to metal particles in the same way it does to a virus or other foreign substance and it will try to attack the ‘invader’. This starts a chain reaction which can lead to many symptoms including Chronic Fatigue Syndrome. 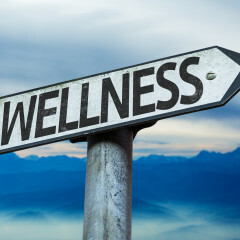 Our unique focus on dental health takes into consideration a patient’s oral health in relation to the whole body, including identifying and treating issues pertaining to allergies and autoimmune disorders. That is why we consider ceramic dental implants to be the better and safest alternative to metal implants. The advantage of these implants is that they are ceramic, and thus there is no concern of corrosion, allergic reaction or electronic interference. Not so simple as a nod to vanity, a healthy mouth and teeth keep you healthy. Dental Implants; more than artificial teeth. They are permanently implanted into the gum tissue and jawbone. The best replacement systems are made entirely of ceramic. They are as strong and beautiful as real teeth. Your bones and soft tissues can’t tell the difference. There is never a risk of reactions or rejection. Implants can replace one or many missing teeth. Getting an implant is easy as long as you have a qualified dentist. However in the age of instant gratification, implants disappoint. Your dentist will determine if jawbone bone density meets requirements. bone density may need to be increased prior to surgery. Initially a post or “root” is surgically inserted into the socket of the jawbone. Eventually fusion of the “root” with the jawbone occurs. A bite impression is made and a crown designed to match surrounding teeth. The crown gets fixed to the ceramic post or “root” for a permanent tooth replacement. Good things come to those who can wait. From start to finish, getting implants can take as little as several months or more than a year. Implants are worth the wait.